This entry was posted in Substance Abuse and tagged Alcohol Abuse and Addiction, Co-Occurring Disorder, Managing Symptoms, Misuse on June 28, 2016 by Team Addiction Hope. Domestic violence is a crime that affects thousands of American families annually. Battered women represent nearly 20 percent of non-fatal, violent injuries treated in emergency-care facilities. According to data from the American Medical Association, almost a quarter of U.S. women will sustain some type of abuse from their intimate partner in their lifetime. 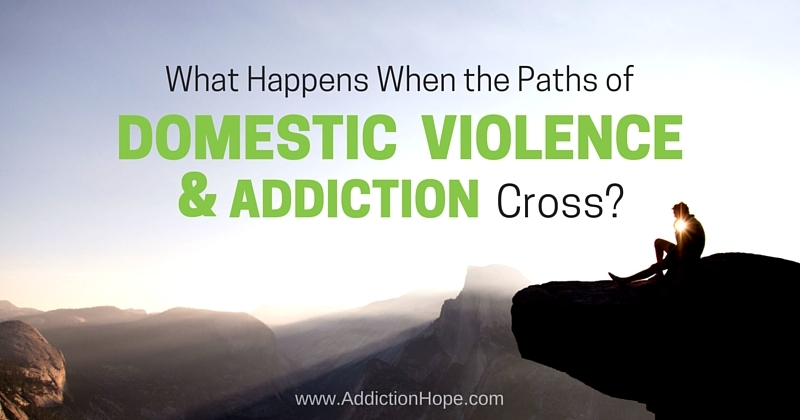 Acts of domestic violence and patterns of addiction have a twisted relationship. Indeed, the two share many of the same predisposing factors. Domestic violence doesn’t discriminate by socioeconomic status, age, cultural background or sexual orientation. While women are more commonly victims of domestic violence than men, there’s a growing awareness of male abuse victims. A study of inner-city emergency department visits involving 233 men found that 28 percent had reported being a recent victim of physical violence. The nature of domestic violence shares many of these traits. Instead of a substance, domestic violence is marked by a loss of control or anger. The behavior escalates (tolerance), increasing in frequency and duration. The abuser may focus on or obsess over aspects of his or her partner’s perceived behavior. Episodes of violence may result in periods of anxiety or remorse (withdrawal). In spite of the adverse consequences (emotional and physical damage), a victim often sticks by his or her abuser. Violence and addictive disorders often co-exist. For alcohol abusers, a loss of impulse control leads to a predisposition for violence. Hallucinogens and stimulants both increase paranoia, heightening the risk for a violent outburst. In some cases, substances do more than simply predispose an abuser to violence. Substance abusers can use their problems to justify their behavior, and their victims sometimes see little wrong with that excuse. Too often, victims say their abusers are only violent when they’re drinking or using their substance of choice. Addictive behaviors and acts of violence focus on the perception of control. An abuser controls his or her victims through sexual, physical or emotional acts of violence while perceiving a loss of self-control at the hands of a substance. Again, periods of remorse often follow an escalation of these behaviors. Effective intervention requires a multi-disciplinary approach. Physicians must become adept in identifying all underlying factors in violent and dependent behaviors. These issues perpetuate one another, so addressing the similarities between them is essential in preventing the relapse in either (or both) actions.